" We didn't make Narendra Modi Awas Yojana, we didn't make Namo Awas Yojana, we didn't make Raghubar Das Awas Yojana, we made Pradhan Mantri Awas Yojana so that the next PM can take the work forward." New Delhi: Prime Minister Narendra Modi on Saturday launched a blistering attack on Congress, claiming the grand old party is least bothered about farmers. “We consider farmers as ‘annadata’ (provider of food), unlike the previous governments who considered them as mere vote bank. Earlier, the Congress government had forced farmers to borrow loans and today they are misleading them with promises of loan waivers,”said the Prime Minister, while addressing a public rally in Palamau, about 160 km from Ranchi. He also showered praise on his government and claimed that NDA believes in transparency as there is no scope for brokers to take advantage of the farmers. “We are working in a transparent manner by directly depositing money in the accounts of beneficiaries of government schemes. There is no place for brokers in the system,” PM asserted. 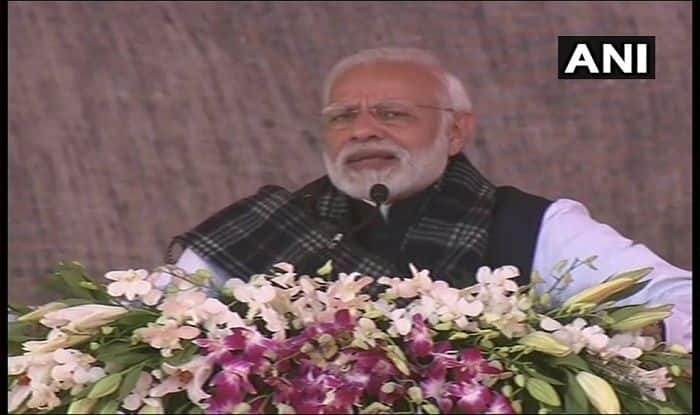 Notably, PM Modi made the remarks after laying the foundation of several irrigation projects in Jharkhand, including Rs 2,391.36-crore Mandal dam, which will provide irrigation to 19,604-hectare area in the state and neighbouring Bihar. The Mandal dam, work on which began in 1972, but was stalled since 1993, will be built on the North Koel river in Barwadih block of Latehar district. The project, once completed, will boost irrigation facilities in Latehar, Palamu and Garhwa districts in the state, besides Aurnagabad and Gaya in Bihar. The Prime Minister also handed over keys of houses to five beneficiaries of Pradhan Mantri Awas Yojana (PMAY). Speaking about the PMAY scheme, the PM said his government was initially criticised for ‘offering nothing new’ under the housing proposal. “Our aim is to provide housing for all, be it the rural areas or the urban areas. We do not believe in naming schemes after politicians, We didn’t make Narendra Modi Awas Yojana, we didn’t make Namo Awas Yojana, we didn’t make Raghubar Das Awas Yojana, we made Pradhan Mantri Awas Yojana so that the next PM can take the work forward,” he said.